Special wide skis for travel on lunar powder. Okay, Verne and others have discussed getting to the moon. But once you are there, how are you going to get around? From Requiem, by Robert Heinlein. This is not as far-fetched as you think. Skiing on sand is done right here on Earth - it's all the rage in Dubai. Spend the morning skiing down the high dunes, with refreshments. 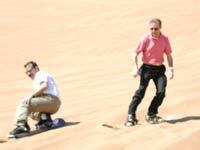 On the way back to Dubai, enjoy dune bashing and camel riding.